Who said to-do lists are tedious? As most of the blogs I follow somehow are either in the southern hemisphere where the glorious spring ascends, or from the London-area where the leaves colour oh-so prettily and the architecture and red double-decker buses make a perfect backdrop in pictures: I am getting into this changing of seasons thing quite a bit. Especially autumn, where the leaves turn brown, the weather gets labelled ‘sweater weather’ (my fave), the wind is getting out of control (as is my hair) and the days get a little more shorter and cosier. My home country doesn’t have many autumn-traditions like the Americans do for example. Going on a hay-ride, go apple picking, visit a pumpkin patch… that sort of stuff doesn’t really happen over here? I’d like to think that I have incorporated pumpkin carving into my yearly traditions, as well as watching the ‘Over the Garden Wall’-show around Halloween. Yet, I feel like I can step up my game in enjoying this season. Therefore, this year I’ve compiled a list of to-do’s especially for this time of year. Not because I’m already counting down the days until Christmas (85 days to be precise), or that I’m a bit hesitant for winter as it’s usually my not-so-good season. Probably both, tbh… But mostly because autumn is fun. And we should allow ourselves to do things for fun a little more often, methinks. What does one put on a autumnal to-do list? I started out with my friend to put things like “drink more water” and “don’t drink any alcohol for a full month (except for that one dissertation-dinner-party-thing for my brother). But all that is not very autumnal — or fun? So, as one does, I made myself a little playlist to get me into the season. 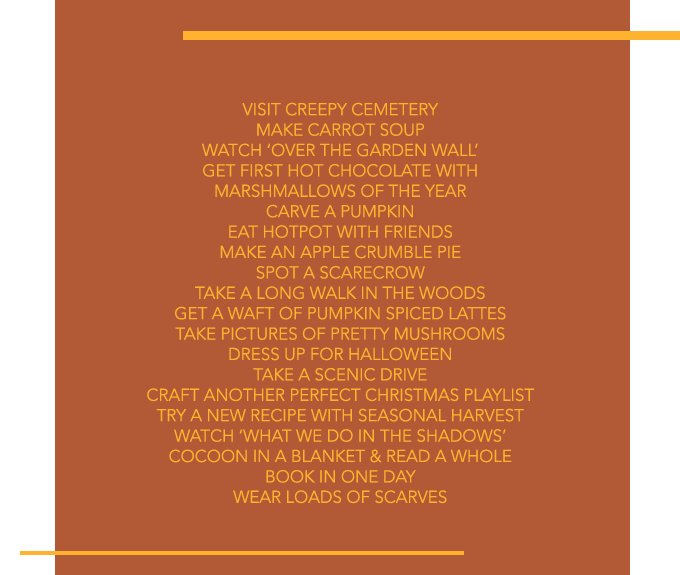 And I started compiling a pretty fun list… one that triggers me to enjoy the little things of this particular season. Of course, I shared the playlist too. It’s a good ‘un, if I may say so myself. (I’m working on a Halloween one- do you have any faves tho? Hit me up!) — Also, if you have any autumn-specific traditions that you’d think I’d enjoy (and can do in a non-halloweeny country): I’m all ears! If you’d like to inspire me with your autumn traditions, I’m all ears too actually.